[update] New development on this front can be found in this article. It is traditionally believed that TCAD device simulator is only useful for simulating one or two transistors. 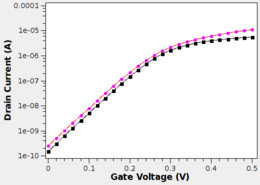 In recent years, TCAD has been used to simulate small circuits, such as SRAM with 6 MOSFETs. However, the traditional prejudice against TCAD simulators is still largely valid. 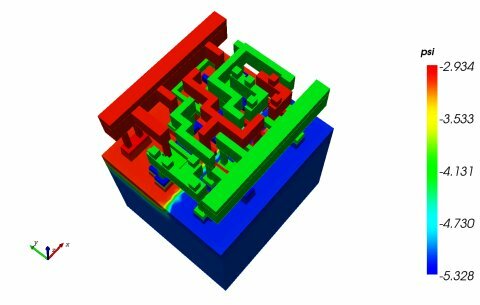 Simulating a circuit beyond 10 transistors, with 20,000 or more mesh nodes seems impractical due to the excessively simulation time and hardware requirement. In this article, we shall present the latest developments at Cogenda. Cogenda offers the world's first TCAD solution that overcomes the 10-transistor barrier, and brings TCAD simulation to a new era. 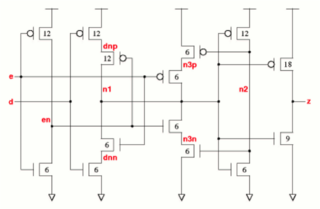 Why is Simulating Larger Circuits Difficult? While modern TCAD simulators do not have a hard limit on the number of mesh nodes (hence the number of transistors), simulating 10 or more transistors is not only extremely expensive in terms of simulation time and hardware cost, but also is prone to convergence problems. As the number of transistors in the circuit grows, as shown in Fig. 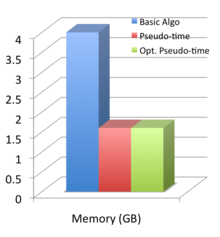 1, the number of mesh nodes in the TCAD model increases. Both time and memory space required in TCAD simulation increases as the problem size scales up. 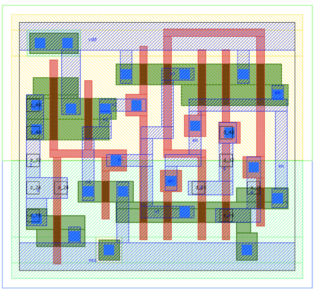 Fig-1 Memory requirement for simulating CMOS circuits with Cogenda's Genius device simulator. The most expensive computation step in TCAD simulation is the solving of linear equations. 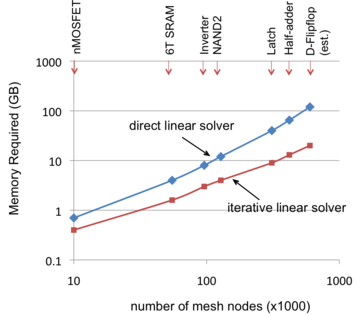 In terms of memory requirement, direct linear solver requires 5-10 times more memory space than iterative solvers for larger circuits, and has worse scaling trend. In terms of computation time, direct solvers have time cost of asymptotically O(n2), where n is the number of mesh nodes. On the other hand, the time cost of iterative solvers scales as O(kn), where k is the number of iterations needed. This makes iterative solvers advantageous for "easy" problems, which converges in a few steps. However, for difficult problems, too many iterations are needed, and iterative solvers could be even slower than the direct solvers. For the most difficult problems, iterative solvers may fail to converge at all. As one goes beyond the simplest circuits, floating nodes or floating regions, the voltages of which are determined by the delicate balance of two or more very weak current paths, appear in the circuit. For example, the latch circuit shown in Fig. 2 will always have two floating nodes (dnp/dnn or n3p/n3n). Fig-2 Circuit diagram and mask layout of a latch circuit. Floating regions are well-known to cause convergence difficulties in TCAD simulation. Technically, floating regions detriment the performance of both linear solver and non-linear (Newton) solver. Firstly, systems with floating regions leads to Jacobian matrices with huge condition number up to 1020. Iterative linear solvers are almost certain to fail in these cases, even some high-performance direct solvers may die in some extreme cases. Secondly, the non-linear solver will often encounter local minima and almost-flat "valleys", and often fail to reach the specified convergence criteria. Traditionally, TCAD users resort to transient-mode analysis for better convergence. One keeps the voltage sources constant and let the device settle to its steady-state. However, this typically requires a large number of time steps. As one is forced to use the expensive direct linear solvers and the slow transient-mode analysis, the simulation time and hardware requirement quickly becomes intolerable as mesh nodes exceeds 100,000. These practical constraints limited TCAD users to the simplest circuits, hence the 10 transistor barrier. Cogenda offers a unique "pseudo-time" algorithm that solves the scaling and convergence problems of TCAD. Figure 3 shows a CMOS latch circuit with 14 transistors and nearly 300,000 mesh nodes, which is unprecedented for TCAD device simulators. Cogenda's Genius device simulator is able to handle this and even larger structures smoothly. Fig-3 Simulated electrostatic potential profile in the latch circuit. The pseudo-time algorithm is a transient-mode method, and shares the same good convergence properties of transient analyses. On the other hand, instead of using the physical time, it uses pseudo time steps that optimally drives the device to its steady-state. Figure 4 illustrates how the pseudo time performs compared to standard steady-state algorithms. The classical algorithm (used in all TCAD software) has convergence issues, and requires direct linear solvers (high memory consumption) and is rather slow. An early implementation of the pseudo time algorithm converges well with iterative linear solvers, saving memory space, and is faster. In the recent 1.7.2-3 release of Genius, an optimized pseudo-time algorithm has been included, which further reduces the simulation time. Although the pseudo-time method contributed a major performance boost to the Genius simulator, it is by no means the single technology behind Cogenda's highly efficient and scalable products. Each component of Genius has to be designed and optimized for parallelism. Any bottle-neck, even one in a less important module, would ruin the overall performance. Through extensive research and development over the past years, Cogenda has successfully crossed the 10-transistor barrier for TCAD device simulation. Simulating circuits with over 20 transistors and 600,000 mesh nodes has become practical with cheap hardware and moderate time. 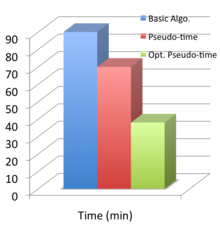 FinFET devices are used in the latest 22nm generation CMOS processes. 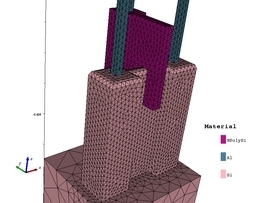 Construct your FinFET model with Gds2Mesh and simulate it with Genius, today.